The remains of President Donald Trump’s star on the Hollywood Walk of Fame on July 25, 2018 in Hollywood, California. The star was vandalized overnight. Late Monday, the West Hollywood City Council unanimously passed a resolution to ask the Hollywood Chamber of Commerce to remove Donald Trump’s star from the Hollywood Walk of Fame. But as much as I’d love to sip on this delicious, cold brew of petty, apparently, nothing is ever easy and all our dreams are unlikely to come true. As the New York Post notes, council members John D’Amico and Lindsey Horvath introduced the resolution to remove the now infamous star, which was awarded to Orange Foolius in 2007 for his work on the Miss Universe Pageant. The Council members cited Trump’s “disturbing treatment of women and other actions that do not meet the shared values of the City of West Hollywood, the region, state, and country. “Having a ‘star’ on the Walk of Fame is a privilege that is highly sought after by those in the entertainment industry, allowing Mr. Trump to continue to have a star in light of his behavior toward women, particularly in the #timesup and #metoo movements, should not be acceptable in the Hollywood and entertainment industry communities,” the resolution read. And that to the fact that Trump’s horcrux star has been destroyed twice—last month with a pickaxe and back in 2016 with a sledgehammer—it seems like a good idea to just get rid of the thing. However, as I said, nothing is ever easy. The Walk of Fame, which hosts more than 2,600 stars is the property of Los Angeles city, and thus, the city has the final decision and the city is not inclined to act, citing the historic significance of the stars and the walk itself. “The Hollywood Walk of Fame is a registered historic landmark. Once a star has been added to the Walk, it is considered a part of the historic fabric of the Hollywood Walk of Fame. 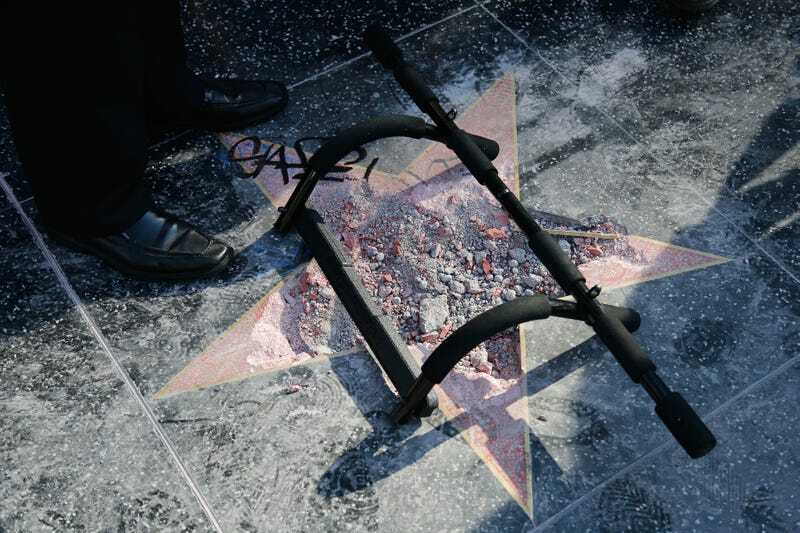 Because of this, we have never removed a star from the Walk,” Leron Gubler, the president and CEO of the Hollywood Chamber of Commerce told the Post. Which, I suppose, explains why stars like that belonging to Bill Cosby, still remain firmly embedded in the sidewalk.